Do you get hip pain? I have had several clients recently showing similar patterns of tight muscles and resulting hip pain, which seems to come from a common problem. 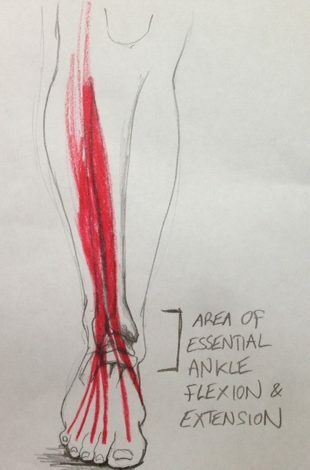 Take a look at this diagram of our ankle joints…. Do you see how many muscles span across the front of the ankle? Now imagine these muscles in a tight and shortened state, the ankle would not be able to move back and forth very easily. When this happens, we are unable to do big bouncy strides, bouncing off the balls of our feet and leaping forward. Instead, the foot is locked into a more static position and our stride is shortened with a flat pronated foot. This then sets up a chain of events where the whole leg movement is strained on to the hamstrings, which in turn tighten and can pin the pelvis down, causing hip pain. The flattened (pronated) foot movement also then sets up a chain of events where, in order to stay upright, the knee takes an inward (medial) dive, putting strain on external rotator muscles at the top of the leg, which then also cause hip pain. If the person is a runner, they end up with a running gait a bit like ‘Rachel’ from Friends, if you remember that funny episode. So the key to avoiding all this is quite simple. The anterior muscles of the ankle joint need to stay flexible and the joint needs to be able to move freely back and forth (flexion and extension). A deep tissue massage focusing on this area, especially if you do regular exercise, will be a great preventative measure to ensure pain free good performance.